… [P]rior to his Supreme Court appointment in 1916, Brandeis became leader of the American Zionist movement, heading a committee to assist endangered European Jews. He would found the American Jewish Congress, the Palestine Endowment Fund and the Palestine Co-operative Company. Zionism expressed Brandeis’ understanding of American values, the same right for Jews as other nationalities to a homeland, to strengthen their claim to equality among the world’s peoples. Palestine, he argued, must not be claimed by war but by purchase and settlement, “with clean hands … [so] as to ennoble the Jewish people. Otherwise, it will not be worth having.” He compared Zionism to the recent independence and unification of Italy, Greece, Bulgaria, Ireland and the more short-lived Servia. For Brandeis, support for justice, fairness and democracy everywhere, in service to “the brotherhood of man,” makes one a better American. Brandeis lived long enough to fear events in Europe and advise Jews to leave Germany but he died in 1941 before we joined the war, and before Israel was born in a bath of fire. May he rest in peace. Instead, conflict has radicalized both Israelis and Palestinians and there seems to be no brakes on the spiral of violence. A Palestinian graduate student at RPI told me Palestinians had every right to kill any Israeli, and Israelis have no right to fight back because they are wrong. His solution was the mirror image of Israel’s, takeover of the other’s land. I pointed out that would lead to the slaughter of everyone on both sides. He shrugged. Muslims from other places listening to us made clear they got my point. But extremists on both sides make peace impossible. I see no mechanisms in their societies to resolve the conflicts and bring people together. Israelis and Palestinians are segregated in their living space, often by walls, boundaries and checkpoints. They are segregated in schools by faith and location. They are segregated in business, finance, wherever they might work together – save where Israeli employers hire Palestinian laborers, who work when Israel allows. Our country has brought people together since the founding, in commerce, finance, colleges and schools. Still we suffer domestic conflict between racial and other groups. Congress and a string of American presidents supported desegregation to bring people together. The formerly segregated South changed a great deal, but backlash persists across America. Curing deep-seated antagonisms is difficult. It is next to impossible where they are reinforced by physical and legal walls. I doubt Israel and Palestine have either the time or the will to build bridges between them. Each believes in re-taking the others’ lands, not sharing them. My concern at this point is for America. I see little advantage to our country in being drawn further into an intractable conflict with religious zealots on both sides who kill peacemakers, national leaders, and noncombatants, to prevent or derail the possibility of peace. I fear that the future includes a great deal of slaughter, and am no longer convinced it can be averted. Our only choice may be whether we, in America, get blamed for it. The Israelis need to hear that message loud and clear. There is no chance of a decent resolution as long as Israel believes they have our unconditional support. — This commentary was broadcast on WAMC Northeast Report, October 27, 2015. 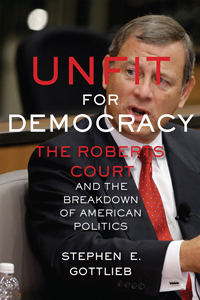 Unfit for Democracy: The Roberts Court and the Breakdown of American Politics 34 (NYU Press 2016). I’d like to start by stating my pride in WAMC and admiration of you, the listeners and members, who not only raised funds to keep the station on the air but also raised funds during the pledge break for the food bank, to help refugees and to retire pollution from the environment. That’s a lot to be proud of. Turning to the Middle East, Russia wants to beef up Assad in Syria. And Putin seems to have confronted us with a fait accompli as it conducts bombing raids. No one wants war with Russia. So what to do? Lots of people have their eyes focused on the Middle East, on Syria and its immediate neighbors. I think that reveals inexperience. Foreign affairs is a chess game. Chess was invented to train the mind for combat. Now I’m no champion chess player. Oh I like to brag that I once beat someone who beat Bobby Fisher, which is true, but my friend hadn’t played in years and I have no idea how old Fisher was when my friend beat him. But just the same I do understand some things about chess. And one of them is that if the other guy attacks one of my pieces where it’s hard to defend, I can look for ways to take advantage of the position somewhere else on the board. Sometimes that forces my opponent to release his grip while dealing with my counter threat, or provide me with a counter-balancing advantage. Chess is often described as a game of position, but rarely is it all about one square or even one piece. So I’m wondering what candidates you might have for places to put pressure on Russia? Ukraine anyone? Or posting troops in Poland? And how about recalculating the effects of Putin’s moves? The EU has been falling apart but a resurgent Russian bear may help put the EU back together. Arab anger has been directed against home grown Sunni regimes and against the U.S., but a resurgent Russian bear may put them in a war with ISIS and could inflame Muslims within Russia. Conservatives want America to be a player in world politics. But being a player is hardly a purpose. I’m more focused on the consequences. People who only keep their eyes on one spot may be experts on that spot, or just naïve. But real foreign policy is global. Russia is not invincible. Putin is not a magician. The games he has been playing have answers. Keep cool. But don’t look for lots of loud talk back. Real warriors don’t scream their intentions. Intentions become known after the fact. That’s what I expect from Obama or any president who is competent in foreign policy and not a big gasbag. As Teddy Roosevelt once said, we need to speak softly and carry a big stick. But it’s also important to remember that big sticks aren’t best wielded in frontal attacks – Picket’s charge lost at Gettysburg. Grant, by contrast, was happy to lay siege at Vicksburg and Richmond, and the soldiers under Sherman rarely fired a shot through a long campaign across Tennessee and then Georgia – except when Jefferson Davis replaced one of his best generals and his replacement immediately attacked the portion of Sherman’s Army he had left behind at Chattanooga. The Confederate Army was then promply defeated by that half of Sherman’s Army. Good soldiers know how to play chess. — This commentary was broadcast on WAMC Northeast Report, October 20, 2015. It was in the wee hours Saturday morning but I turned in the index and the page proofs to NYU Press. I wanted a thorough index for the book, but in the end, it was too ambitious and I had to cut some. There must be lots to do now but can’t remember what – the book and the index have so completely occupied my mind. Jeanette has been a saint. This commentary is occasioned by the partial legalization of marijuana and government efforts to regulate it. But I’d like to take the occasion to look at the drug problem more broadly. Let me start with a story. Aside from the time a neuro-opthalmologist put a drop of cocaine in my eye to test for a nerve condition, I have had drugs in my system only once. Shortly after we got married, we were at a party in the Village and were offered Alice B. Toklas brownies. I was too naïve to know what they were but boy they tasted good and I had a few too many. Then my limbs started drifting off into space and I got pretty upset. Plus I was upset with my wife who refused to call the doctor. Once I came out of it and understood what had happened, I wasn’t interested in repeating the nightmare. In the seventies, we were offered drugs by friends. Having had that experience with the brownies, I was not about to accept their offer. But I had two other thoughts that were and are equally important to me. First, whatever drugs we accepted would undoubtedly have passed through the hands of organized crime, thieves and murderers among them. I was not about to support that pipeline. And I would have put my license as an attorney at stake if anyone had found out. But, like the ACLU and the NYCLU, I have long supported the decriminalization of drugs. Decriminalization is partly an opportunity to regulate to prevent drugs being cut or concentrated in dangerous ways. Medical marijuana should give us that opportunity although, at the moment, it will have to be state by state. I would try selling it in state stores the way alcohol is sold in some parts of the country. Decriminalization is also an opportunity to take some of the money out of the criminal pipeline, to withdraw our financial support for the Mafia and other organized crime enterprises in many parts of the world that supply the American drug habit. And decriminalization will also withdraw some of the money that goes into the financial pipeline for terrorists and terrorist organizations that are also exploiting the drug trade in many parts of the world. I understand that long term FBI Director, J. Edgar Hoover, feared FBI agents would be corrupted if they policed the drug trade. Indeed police involvement in the drug trade has been reported in many communities. Decriminalization will cut off that lure to joining the underworld. Decriminalization would help us address the process of turning people under the influence into hardened criminals. And decriminalization will help us address the negative impact of the criminal justice system on the African-American community. Whatever the reason, whether it’s stereotyping, discrimination, or the fact, as many police chiefs have described, that it’s easier to find drugs on low level users and sellers on the streets than the more lucrative but more hidden traffic into the suburbs, decriminalization will help us deal with the mass incarceration of the African-American community and the damage that does to all of us, both Black and white. The remedy, the so-called War on Drugs, has been much more harmful than the disease. — This commentary was broadcast on WAMC Northeast Report, October 13, 2015. The shooting at a community college in Oregon saddens me and leads me to these observations about guns. One of my students has convinced me that the guns used in most of the recent mass shootings do not fit the description of assault or military style weapons. And they don’t fit the categories banned or regulated by the so-called New York Safe Act. In fact some of the damage was done by pistols, by handguns. So I have reluctantly come to the conclusion that the New York statute is a piece of high profile posturing, sound and fury signifying nothing. Who knew? Perhaps the problem is a bunch of people writing legislation about something they know little about. I won’t speculate. Certainly there are weapons that no people ought to have their hands on unless they are in the military – not even police need bombs. But more than that, gun ownership should be licensed. All of us have licenses. I have a driver’s license and a law license. It’s a reasonable protection for all of us. If I can’t see well enough I won’t be able to get behind the wheel. That’s a good thing – regardless of how I might feel about it when and if that happens to me. And when I was a practicing attorney, people who came to me could expect that I could help them. That too is a good thing – although lawyers, professors and students have all sorts of quibbles about what is actually on the bar exam. Plus the bar examiners want to know if we have good character, and they collect affidavits from everyone we have ever worked for, to make sure. Licensing makes sense, to make sure that people with guns have no record of crime or insanity as well as the knowledge to handle and store guns carefully. Licensing will not stop everyone from getting guns who shouldn’t have them. I lost a client years ago, the dedicated leader of a community organization, to a disgruntled job-seeker. But licensing would help. And tracing technology would deter some shooters. Nothing in the decisions of the Supreme Court denies the ability of states and cities to do record checks, licensing or require identifying technology. The resistance of the NRA to licensing and tracing methodology is so irrational and so perplexing that it makes one wonder about their loyalty as well as their good sense. Indeed I think the NRA has been catering to the extremists in its membership, and some reflect the same animus. An NRA president recently referred to “The War of Northern Aggression”, his description of the secession of the Confederate States and South Carolina firing on Fort Sumter, the federal fort protecting the Charleston harbor. Some gun toting members of private militia style organizations clearly are aiming their rhetoric at public servants, at government, and at the people they call “Fourteenth Amendment citizens.” That’s right, they object to the fact that our Black brothers and sisters are free, equal, citizens who can and do vote. In other words they are still fighting the Civil War. Hate groups are proliferating in this country. They are the most determined gun owners. All it takes is one of their number splitting off and firing into a crowd. Timothy McVeigh, who bombed the federal building in Oklahoma City was nursed in those groups. Do you really want to put gun policy in their hands? Or, for that matter, people who posture about gun control without taking the time to study the problem? — This commentary was broadcast on WAMC Northeast Report, October 6, 2015. You are currently browsing the Constitutionalism and Democracy blog archives for October, 2015.